Influenza ("flu") is a contagious disease that spreads around the United States every year, usually between October and May. A dose of flu vaccine is recommended every flu season. Children 6 months through 8 years of age may need 2 doses during the same flu season. Everyone else needs only one dose each flu season. 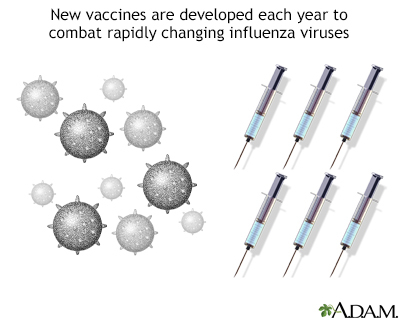 There are many flu viruses, and they are always changing. Each year a new flu vaccine is made to protect against 3 or 4 viruses that are likely to cause disease in the upcoming flu season. But even when the vaccine doesn't exactly match these viruses, it may still provide some protection. If you have any severe, life-threatening allergies. If you ever had a life-threatening allergic reaction after a dose of flu vaccine, or have a severe allergy to any part of this vaccine, you may be advised not to get vaccinated. Most, but not all, types of flu vaccine contain a small amount of egg protein. If you ever had Guillain-Barré Syndrome (also called GBS). Some people with a history of GBS should not get this vaccine. This should be discussed with your doctor. Young children who get the flu shot along with pneumococcal vaccine (PCV13) and/or DTaP vaccine at the same time might be slightly more likely to have a seizure caused by fever. Ask your doctor for more information. Tell your doctor if a child who is getting flu vaccine has ever had a seizure. Persons who believe they may have been injured by a vaccine can learn about the program and about filing a claim by calling 1-800-338-2382 or visiting the VICP website at www.benefits.gov/es/benefits/benefit-details/641. There is a time limit to file a claim for compensation. Contact the Centers for Disease Control and Prevention (CDC): Call 1-800-232-4636 (1-800-CDC-INFO) or visit CDC's website at www.cdc.gov/flu. Vaccine Information Statement. Influenza (Flu) Vaccine (Inactivated or Recombinant): What you need to know. Centers for Disease Control and Prevention website at www.cdc.gov/vaccines/hcp/vis/vis-statements/flu.html. Accessed August 10, 2015.